Enjoying this Classic Pecan Pie with family and friends can be a wonderful way to sweeten a holiday gathering. (NAPSI)—Time spent sharing a traditional holiday treat with family and friends can be a wonderful way to sweeten your day. 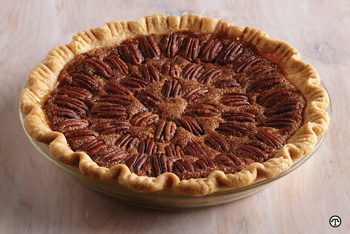 Here, for Thanksgiving, is a Classic Pecan Pie recipe created by the trusted experts at Karo Syrup’s Test Kitchen. Plus, for a definite crowd-pleaser at any family gathering, try this Creamy Caramelized Onion and Bacon Dip, delicious and easy to serve with kettle chips, snack crackers or fresh vegetables. 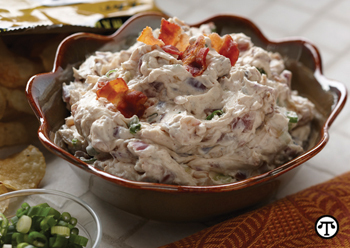 This Creamy Caramelized Onion and Bacon Dip is a crowd-pleaser at any family gathering. For more seasonal recipes and tips, visit www.KaroSyrup.com or Facebook.com/KaroSyrup. *To use prepared frozen pie crust: Place cookie sheet in oven and preheat oven as directed. Pour filling into frozen crust and bake on preheated cookie sheet. Recipe Note: Pie is done when center reaches 200° F. Tap center surface of pie lightly—it should spring back when done. For easy cleanup, spray pie pan with cooking spray before placing pie crust in pan. If pie crust is overbrowning, cover edges with foil. Cook bacon in large skillet over medium heat until crisp, about 10 minutes. Remove bacon to paper towel−lined plate to cool; crumble. Remove all but 2 tablespoons of the bacon grease from skillet. Add butter to skillet with bacon grease. Stir in sweet and red onions and cook over medium heat until soft (about 5 minutes), stirring frequently. Stir in 1 tablespoon corn syrup. Continue to cook for 10 to 15 minutes until onions are caramelized. Stir in remaining 1 tablespoon corn syrup, vinegar and crumbled bacon. Mix well and remove from heat. If needed, drain any excess grease. Let mixture cool for 20 minutes. Beat sour cream and cream cheese in a bowl with hand mixer until well blended and creamy. Stir in green onions. Stir in caramelized onion and bacon mixture and mix well. Serve immediately or chill until ready to serve. Garnish with additional bacon and green onions, if desired. Recipe Note: While dark corn syrup is preferred, light corn syrup may be substituted if desired.